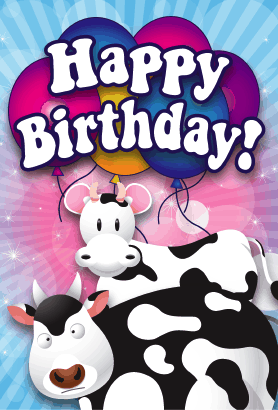 This birthday card features cows on the front, and will print on standard 8.5x11 paper, which is then folded in half. This Printable Birthday Card is available to download for free, or you can download a customizable version for only $3. The $3 version comes as a Microsoft Word DOC file. You can edit the card with Word or any other word processor that can read DOC files. If you don't see a birthday card category that you want, please take a moment to let us know what you are looking for.